Within the limits of Black Hills National Park in the state of South Dakota, lies a natural depression of about 200 meters wide with high walls which as a huge amphitheater, offers a perfect place for launching balloons, protecting them of the surface winds. The depression is located about 2.5 kilometers of the route 16 that connects Rapid City with Mt. Rushmore. During 19th century the site was a destination for Gold seekers. The Bonanza Bar Mining Company was organized in about 1890 to do placer mining on Spring Creek near Rockerville, SD. One of Company mines was on about 80 acres of property known as "Moonlight Valley" (later to become the "Stratobowl"). There, active mining took place from 1893 to 1905. Later, for a few years during the early 1930's, a few family members conducted placer mining operations on a small scale, but there was hardly enough gold produced to make a living. However, would be not the gold found what made it to enter in history books, but a series of exploratory balloon flights conducted at the site in the 30's and 60's decade. The first ones which inaugurated early the era of manned stratospheric explorations took place in the biennium 1934-1935 when the Explorer I and II balloons were launched from the depression, seting new records in altitude in two separate flights sponsored by the National Geographic Society and the U.S. Army Air Corps. At that time the site was known as "Stratocamp". A plaque embedded in the rocks that sourrounds the site serves as a remembrance of the feat. 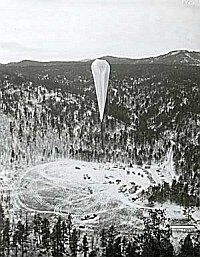 Subsequently, in the late 50s, and under its current name of "Stratobowl" it would be used again for launching stratospheric balloons, both unmanned an manned under the Navy's Stratolab project. The two manned flight's of that series were carried out in 1956 and 1959 respectively. In 1960, again the Navy used the site to test a new kind of balloon being developed to transport only one man in autonomus, powered flight. 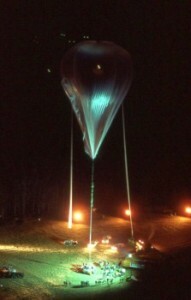 Althought the project was abbandoned, this was the antecesor of the modern hot air balloon, later developed by Ed Yost. After this golden age of stratospheric flight, the "Stratobowl" would dive into oblivion, being merely another tourist attraction in the area. Soon, some unfortunate accidents which occurred there with visitors, forced the park authorities to restrict access by removing markers of the entrance road. Three decades after the last balloon flights of the Navy, the site would attract again the attention of other aeronauts. That was the case in November 1982 when Maxie Anderson and Don Ida tried to perform the first round the world attempt launching his balloon from the Stratobowl to no avail: they were forced to abandon the feat in Canada due to leaks in the balloon. A few years later in November 1996, Steve Fosset made his first round the world solo attempt. Also he was forced to land in Canada after covering about 2.200 miles. He would wait until 2002 when finally on his sixth attempt, he would succeeded. For the 70th anniversary of the first Explorer flight, Stratobowl draw the attention of national and international balloon community when the Balloon Historical Society in an emotional ceremony inaugurated four granite monoliths erected as a reminder of the ballooning feats acomplished there. Aside it's ballooning history -which is also remembered each september with a traditional hot air balloon race held there- the Stratobowl is a very attractive spot for ecological tourism on the Black Hills. For a more in-deep knoweledge of the pioneer balloon missions performed at the Stratobowl I suggest you to read "The two Explorer stratosphere balloon flights", an article written by the aerospace expert Gregory Kennedy, to celebrate the 75th anniversary of that effort. On it, with his usual accuracy and particular style, the author offer us a detailed account of two of the biggest stratospheric flight efforts of the first half of the twentieth century.